Want to enjoy great value, delicious and authentic Italian cuisine in a location close to you? Bella Italia serves up a delicious menu of favourites to suit every taste. And with Bella Italia vouchers, you can enjoy a fantastic meal out without spending a fortune. Whether you're planning a romantic dinner for two or want to treat the family to a fun evening out, a Bella Italia voucher is a great way to treat your tastebuds for less. The Bella Italia brand began life in the 1970s when Pizzaland, the UK's first US-style pizza chain, opened its doors in London. A fun and original concept, Pizzaland was an instant hit and grew to have 30 restaurants in the UK alone by the late 1970s. On the back of this success, the company launched Pastafichio, offering customers a broader range of Italian cuisine. Successful throughout the decades, the restaurants were given an overhaul in the 1990s which transformed them into Bella Pasta, the iconic nationwide Italian restaurant chain that many generations have known and loved. In 2002, Bella Pasta was rebranded as Bella Italia to reflect the wide range of Italian-inspired food on offer, and today the chain operates over 90 restaurants across the UK. They are owned by the Tragus group, which also owns chains such as Cafe Rouge and Strada, and specialise in offering great tasting, value for money food in a relaxed and friendly environment. The menu at Bella Italia is regularly updated and represents some of the best of classic Italian cuisine as well as some more unusual options. The main menu features popular pizza, pasta and grill dishes alongside plenty of starters, sides and speciality dishes, while the lunch menu offers a variety of lighter bites and dishes as well as burgers, calzones and more – all at great value prices. The breakfast menu features traditional English breakfasts alongside more continental options like pastries, pancakes and ciabattas, and the seasonal specials menu is packed with the latest dishes created to make the most of whatever fresh ingredients are available. The desserts menu offers plenty of tempting treats to finish off your meal, while the extensive wine list features some fantastic Italian wines, including many from small producers. For the little ones, there is a great kids menu packed with all their favourite dishes. Bella Italia is also a great destination for those with dietary requirements or food allergies that don't want to miss out on a great evening out. With plenty of vegan, vegetarian and gluten-free options available across all the menus, having a restricted diet shouldn't mean you can't enjoy delicious, great value Italian cuisine. Want to dine out for less? With Bella Italia vouchers you can tuck into great food and save money at the same time. Whether you want pizza and pasta for the whole family or a three course meal for two, Bella Italia offers are a great way to spend less on eating out. Browse our website to find Bella Italia vouchers that suit you, then navigate to their website to find out more. Print out your Bella Italia voucher and book a table if required. Ask Italian offers no voucher codes? Not to worry, in the category Food & Drinks you will find a lot of nice coupons and voucher codes for stores such as Cafe Rouge, Frankie and Bennys or Pizza Express. Visit their website to find a restaurant near you. Print out your Bella Italia vouchers and book a table if required. Present your voucher on arrival and enjoy your meal. Need to contact the team at Bella Italia? Whether you want to reserve a table, have some questions or feedback about the restaurant's food or service or just want to find out more about saving money with Bella Italia discount vouchers, you can contact the Customer Services department by telephoning 0207 121 3200 or filling in the online contact form here. Want to find out more about what's cooking in the kitchens at Bella Italia? Did you know the company maintains a strong profile across all your favourite social media networks? Follow them to find out when new menu items appear, learn more about the latest Bella Italia voucher code, enter competitions and more. Don’t forget to check them regularly, as you can never be sure when a free Bella Italia discount code might be waiting for you! Want to plan your Bella Italia experience while on the move? With the official Bella Italia app for Android and iPhone you can find your nearest restaurant, view the menu and book a table all at the touch of a button. 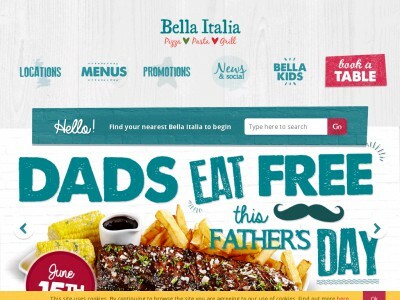 You can also get all the latest Bella Italia offers direct to your mobile device, find out about special VIP perks, read customer reviews and ratings and even get real-time directions straight to their door. Buy now online at www.bellaitalia.co.uk. While searching for somewhere to enjoy a romantic meal on a budget, I discovered the savings you can make at bellaitalia.co.uk with a Bella Italia voucher. Bella Italia offers a wide range of delicious Italian cuisine at its chain of nationwide restaurants, including classic pasta and pizza dishes and some with a more modern twist – all of which can be discounted using Bella Italia voucher codes. My husband and I were able to enjoy a fantastic three course meal along with a bottle of wine for an amazing price, all thanks to Bella Italia vouchers.